When I moved the chickens to the LRB to keep them from all becoming coyote food, I was excited to try out the concept of a “poop board.” Yeah, not a very thrilling name, but the idea intrigued me. As I’d been looking through coop designs online and trying to figure out what would be best for our flock and keep things as simple as possible I kept seeing coops with these poop boards. Basically a shelf under the roosts to catch the poo that the birds like to deposit all night. Then they can either slide out or be scooped and the poo can be added directly to a compost or manure pile. The idea I gravitated toward was the one that used Sweet PDZ which is a stall freshener used in horse stables. I use it on the goat side of the barn to keep the ammonia neutralized so I was familiar with it. It’s little granules, smaller than kitty litter, but it dries stuff out is the idea. So I turned the wider shelf in the LRB into the roost complete with poo-board covered in Sweet PDZ. At first I thought it was a smashing success of an idea. But the charm of having to scoop poop several times a week VERY quickly wore off! The Sweet PDZ was dusty! And it’s not really meant for scooping. So I’d be up there enveloped in a cloud of chicken poo/Sweet PDZ dust and not really enjoying the process. Plus the kitty litter scoop that I had wasn’t a fine enough mesh so small clumps would just fall through leaving the poo board not every completely scooped. Another thing, chickens poop a LOT! For real! I dragged a 5 gal bucket of it down to the compost bin a couple of times before I just started dumping it on the goat manure pile. Chicken poo smells worse by the way! Yuck! 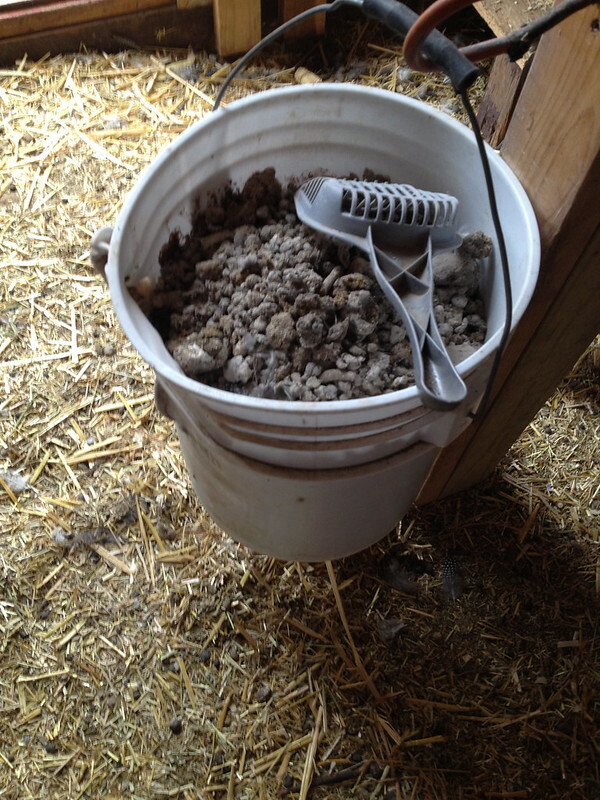 There was always one or two who would attempt to “help” me scoop, but chickens scratching creates all the more dust to deal with and the ENTIRE barn was covered in thick dust, it’s just gross! 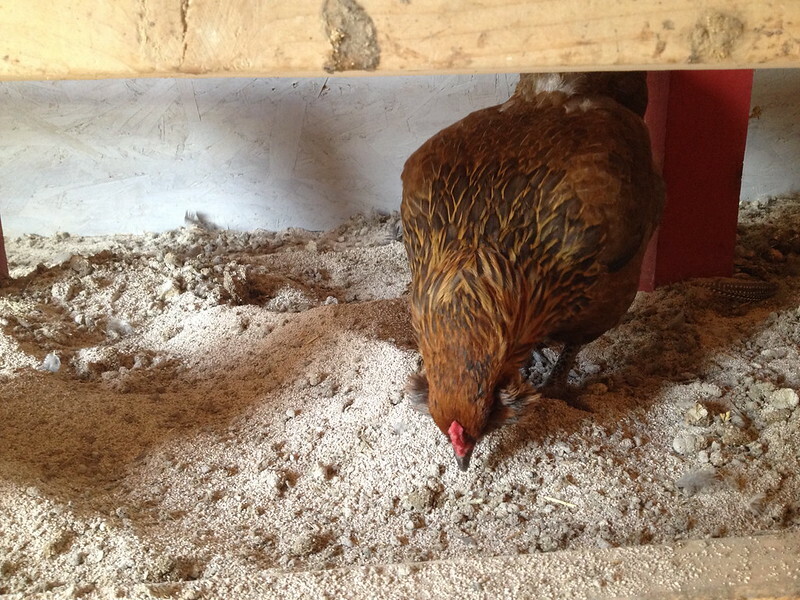 At least I was able to figure out that the poop board method was NOT for us before we built the new coop! That is a plus for sure! 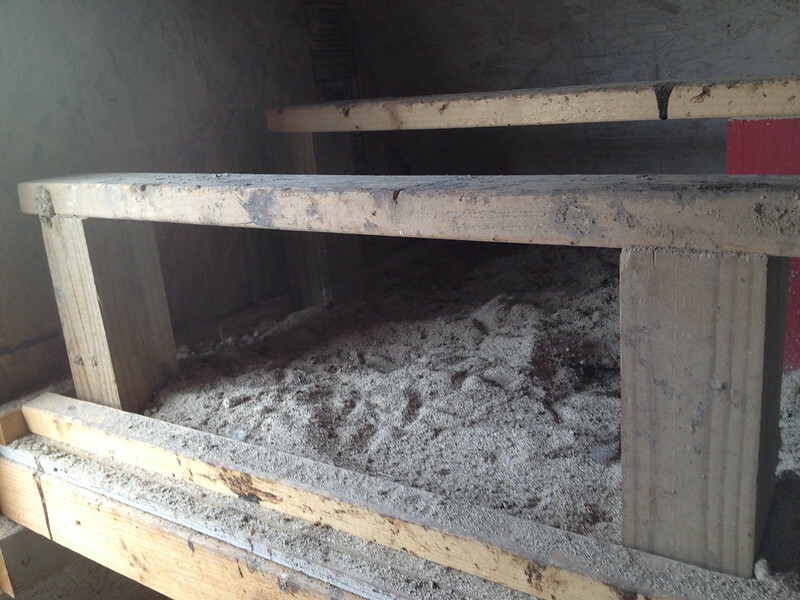 The method that we used with them in the old coop was the deep litter method and it worked great for us! The chickens take care of most of their own maintenance and I only have to clean it out a time or two a year. 🙂 Works for me!